The Regal Airport Hotel feels something like a relic, with its cavernous lobby and retro design details. 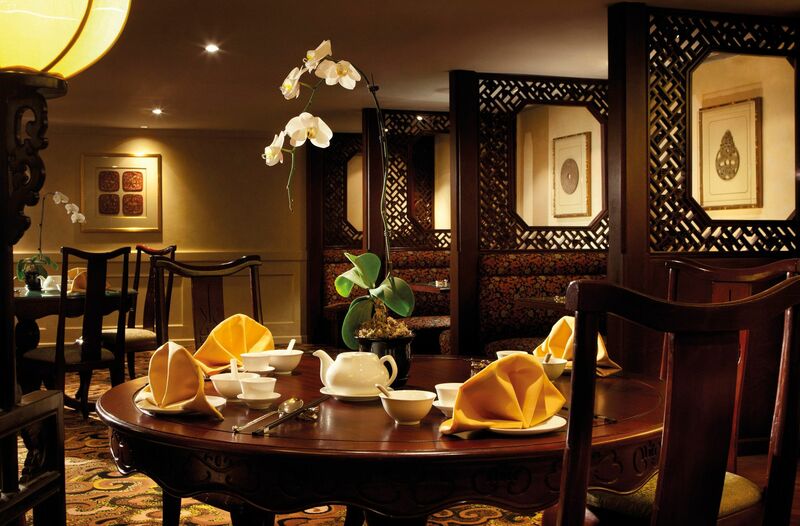 Dragon Inn is tucked away in a quiet corner, and has the look of a typical Chinese restaurant from earlier days, with ornate carpeting, polished wood furniture and curling orchids. The booths with their carved wood dividers lining the sides of the restaurant are recommended for more intimate dinners. Rather quiet most evenings, the restaurant is usually dotted with a mix of travellers and hotel guests from all corners of the globe. Like its counterpart in Sha Tin, Dragon Inn specialises in food from the Huai Yang tradition. The menu is quite sizeable and offers a good cross-section of dishes, with many that will be familiar to fans of Shanghainese cooking. Xiao long bao are presented in a thoughtful manner, with the dumplings laying on top of a layer of carrot on individual bamboo ‘platforms’ with handles for easy lifting from the steamer. They’re juicy, but the pork meat is a little too uniform. Bowls of hot and sour soup are also enjoyable, with just enough chilli heat and tang from vinegar, and plenty of julienned wood ear mushrooms and bamboo shoots for texture. Less successful were the river shrimp stir-fried with longjing tea leaves, for the shrimp had an unappetising slimy layer (perhaps from a touch too much cornstarch) and a slightly fishy aroma; the dish went mostly untouched. A typical dish of braised pork belly with egg has the distinct sweet and caramelised soy notes expected from the genre, and while the flavour is enjoyable it’s wasted on the dry meat; a longer and more gentle braise would have rendered the pork more tender. We finished with black sesame dumplings, which were soft little glutinous rice parcels that contained a filling with a suitably lava-like consistency. The wine list leaves a lot to be desired if you wish to only have a glass (as we suspect many would, with many travellers being pressed for time). The by-the-bottle list is broad, however, with selections in most new and old world regions, and a handful of Chinese liquors. The best part of the dining experience at Dragon Inn is the service, with a team of kind waiters who serve with a smile. The only hiccup in the night was when our plates and bowls were not changed even though they were heavily soiled from various sauces. A meal for two with tea and service will come to around HK$700-800, which is inexpensive for a Chinese restaurant. However, given the inconsistent quality of the dishes and farflung location we may think twice about returning.